On Saturday, May 28th, Larry, Drie and I decided to take a trip out to Port Huron, Drie's first "real" trip to the city. We spent most of the day along the riverfront, checking out the views and attractions from the Blue Water Bridge and just South. We started at the "Lightship Huron" (now museum) and enjoyed our first visit to the ship. 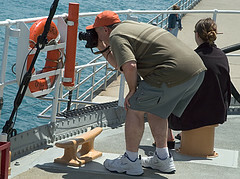 Larry shoots some of the Lightship Huron's finer points while Drie attempts to stay warm on the deck. What an excellent view from the deck of the Lightship Huron. Well, perhaps not. 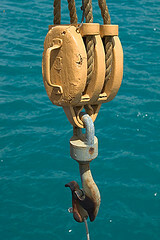 The spiderwebs to this large pulley are a pretty good indication that this has not been used for sometime. 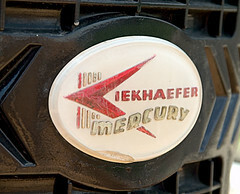 This logo was on the outboard motor of the lauch on the deck of the Lightship Huron. Department on Mines? On a ship? 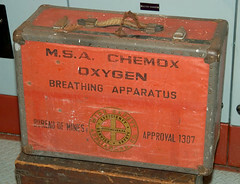 This case is displayed in the engine room of the Lightship Huron. 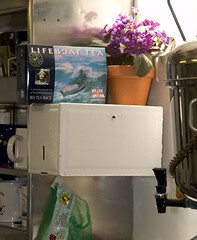 The galley of the Lightship Huron isn't all that exciting, but I thought the placement of "Life Boat Tea" over the sink was worth the photo.